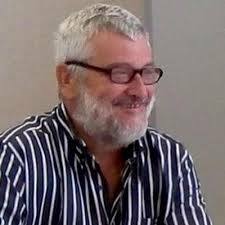 The History of Education Society welcomes a post by Bernat Sureda García and Francisca Comas Rubí from the History of Education Research Group (GEDHE) at the University of the Balearic Islands. In 1914, whilst the first trials of the method were being run at the Barcelona Casa de la Maternidad (Children’s Home) by Joan Palau Vera –who had attended the first International Montessori Course in Rome in 1913– seven teachers and inspector Leonor Serrano, with bursaries from different local governments, were attending the second International Montessori Course in Rome. Barcelona City Council founded the first Casa dels nens in 1915 that followed the Montessori method. The method quickly spread and by 1915 there were already 13 schools using it. At the end of 1915, Maria Montessori came to Barcelona to prepare the 3rd International Montessori Course to be held in the city at the beginning of the following year. The course included theory and practical sessions at the experimental school of Barcelona County Council run by a Montessori disciple, Anna Maccheroni. The course led to the foundation of the Agrupación de Amigos del Método Montessori (Friends of the Montessori Method) and Barcelona County Council created a special department run by M. Montessori, who spent several periods in Barcelona. The spread of the method encountered problems, however, when Primo de Rivera declared his dictatorship, although expansion recovered with the arrival of the 2nd Republic in 1931. Whilst the method enjoyed widespread support, its links to the industrial bourgeoisie in Catalonia not only led to opposition from the dictatorship but also to some progressive sectors regarding it with suspicion due to its religious bent and the elitist nature of some of the trials. During the 2nd Spanish Republic, the M. Montessori method was widely applied in primary schooling in Barcelona and many other cities in Catalonia. The spread of the Montessori method coincided with the development of the illustrated press and the use of photography in publications. In general, progressive schooling methods that expanded in the early 20th century used photography to demonstrate how their approaches were different from traditional methods. 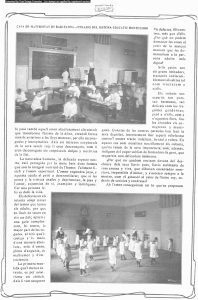 The illustrated press in Spain published several reports on the Maria Montessori method, a topic we have analysed in our article: ‘The Photography and Propaganda of the Maria Montessori Method in Spain (1911–1931)‘ published in the journal Paedagogica Historica. 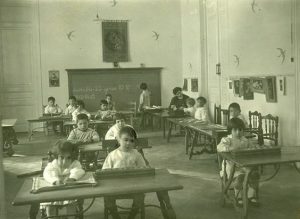 The book ‘L’escola pública de Barcelona i el mètode Montessori‘, published by the Culture Commission at Barcelona City Council in 1933 during the 2nd Republic, also includes many photographs of the Montessori schools in Barcelona. This book, which can be downloaded online, reviews Maria Montessori’s influence in Barcelona, presenting the different schools that used her method and reproducing many photographs of the activities they ran. Both the photographs published by the illustrated press and those in books relating the implementation of the Montessori method in Barcelona comprise an iconographic message that publicised the characteristics and benefits of the new method. 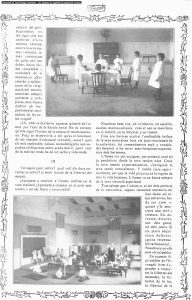 Sureda; X. Motilla & F. Comas, (2014) The magazine Feminal: photography and visualization of the feminine contribution to the educational reform in Catalonia 1907-1917. Historia de la Educación, 33, 215-230. Comas & B. García, (2012). 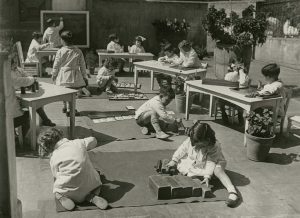 The photography and propaganda of the Maria Montessori method in Spain (1911–1931). Paedagogica Historica, 48(4), 571-587. This study will be conducted within the framework of the EDU2014-52498-C2-2-P project, entitled ‘Photography Published as a Representation of Changes and Continuities in School Culture (1900-1970)’, funded by the State Programme for the Promotion of Scientific Research and Excellence, a state sub-programme for the generation of knowledge (2014 edition). 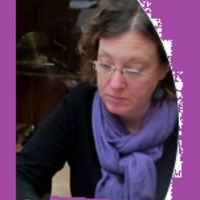 Francisca Comas Rubí is a Senior Lecturer in the History of Education at the University of the Balearic Islands, a member of the GEDHE and the main researcher on several funded research projects looking at the use of photography as a resource within the history of education field. Figure 1 and 2. Montessori experiences at the Casa de Maternidad in Barcelona. Note: Feminal, supplement of Ilustració Catalana, September 27, 1914, digital newspaper archives of the Biblioteca Nacional de España. Figure 3. 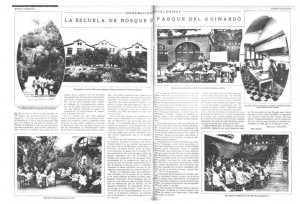 Article on the Forest Schools at Guinardó Park in Barcelona, where elements of the Montessori method were applied along with the Decroly method. Note Mundo Gráfico, May 29, 1929, digital newspaper archives of the Biblioteca Nacional de España.